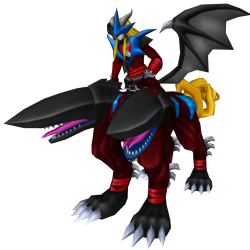 Difference between revisions of "GranDracmon (X-Antibody System)"
GranDracmon (X-Antibody System) is a Demon Beast Digimon and a carrier of the GranDracmon X-Antibody Seal in its Digicore. GranDracmon (X-Antibody System) was added to Korean Digimon Masters on August 08th, 2018. GranDracmon (X-Antibody System) was added to Global Digimon Masters with the August 28, 2018 Patch. Eye of the Gorgon Pitch Black attribute 2 seconds cooldown 48 DS consumed Learned at Lv. Imprisons the mind of the opponents in the darkness by staring at them with its evil eyes. Crystal Revolution Pitch Black attribute 8 seconds cooldown 184 DS consumed Learned at Lv. Uses the ice crystal upon the enemy.